Google announced a week ago that there is a new way to count conversions in Adwords. Before these changes, there were two kinds of conversions: one per click and many per click. 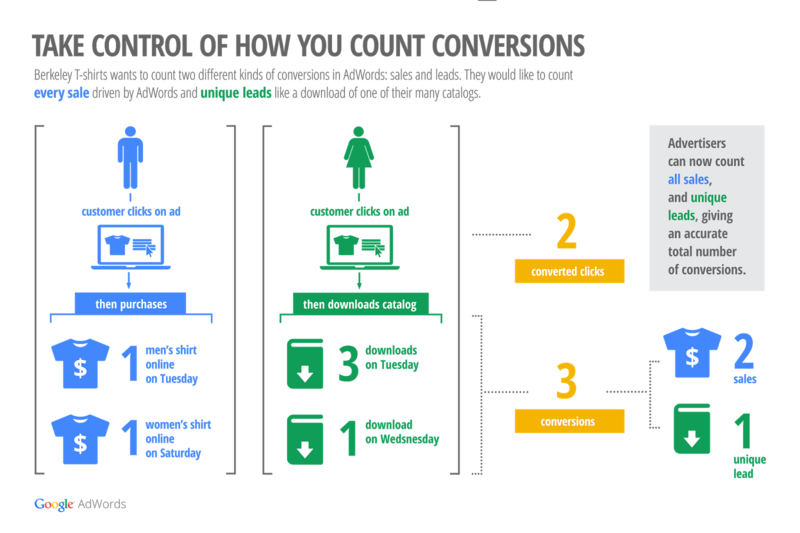 These ones count a conversion for every AdWords ad click resulting in a conversion within 30 days (the number of days you have specified for the cookie’s life). If there is more conversion following this single click, they won’t be count. This is useful when you want to measure the conversions for unique customer acquisition. These ones count a conversion every time a conversion is made following an Adwords click (within the number of days specified for your cookie’s life). It counts all the conversions made after one click on an ad. It’s useful when you want to measure for example all the purchases in an e-commerce shop. A click is converted when there is at least one conversion following this click. If there is more than one, only one will be counted. It’s useful to count unique leads. “All” will track all the conversions following the click on the ad. If your customer makes 4 purchases, 4 conversions will be counted. In this example, “Unique” will only count one conversion. We try as soon as possible to take into account all the changes made by Google Adwords. Converted clicks and conversions are already live in Sunnyreports! You can find them in the list of the KPIs available to create your Adwords reports. This entry was posted in Adwords, SunnyReports and tagged adwords, conversions, sunnyreports. Bookmark the permalink.